I was born in Kobe,Japan. From an early age I was inspired in art by my grandfather,a sculptor, and developed an intense interest in painting, particularly portraits. Right hand;Nikon F4 + 200mmF4D + TC-201+PK13,PK12,PK12 (3:1 super micro weapon called " Bazooka") with two SB-26 strobe by using JUNNON housings. I usually bring two cameras. In my profession facial expressions play an important role, and my interest in it extended underwater. I married at 27.My wife is a PADI Dive Master too. 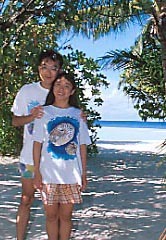 At Vadoo diving paradise,the Maldives with my wife. We can see many beautiful fishes at the house reef of Vadoo diving paradise, South Male Atoll. This island is a paradise for goby freak divers! I've been there four times! 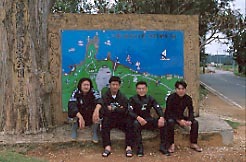 We love Okinawa Island and enjoy beach diving here. 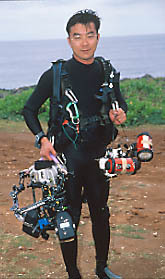 Fortunately,there are many super goby freak divers on Okinawa because we can discover many unknown species. 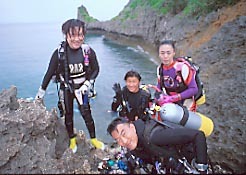 With my super goby freak divers at Cape Maeda,my home ground. Please keep away from us ! Or you should be infected with our fever ! My portfolio appeared on "SPORT DIVING"
and "U.W.F. vol. 2" in Germany. Please refer to them. With my friends and my wife. They are one of the infected divers with our fever.They came from Tokyo only to see gobies in Maeda.Many divers visit us to see goby goby goby! Let's go to gobies! !